Please fill out and submit this “Interest Card” to be considered for the June 15th Civil Service examination. Application deadline is June 7, 2019 at 3:00 pm. Any interest cards received after the deadline will be stored for the next examination date. Again don’t forget to bring your completed Personal History Statement with you when you take the examination or you will not be eligible to take the examination. Thank you for your interest. *NOTE: You need to use the name as it appears on your state issued driver’s license. New officer signing bonus: New officers with no experience will receive $2,500.00 bonus upon completion of field training. New officers that hold a current TCOLE Peace Officer Certification will receive a $3,500.00 bonus upon completion of field training. For applicants with prior employment as a full-time law enforcement officer, credit for previous experience may apply. Credited Previous Experience shall be defined as one year of credited experience for every full year actively employed as a full-time law enforcement officer in a municipality with a population of 30,000 or more, a county with a population of 125,000 or more or a state law enforcement agency, not to exceed five years of Credited Previous Experience. Credited Previous Experience shall also be defined as one year of credited experience for every two full years actively employed as a full-time law enforcement officer in a municipality with a population of less than 30,000 or a county with a population of less than 125,000, not to exceed five years of Credited Previous Experience. 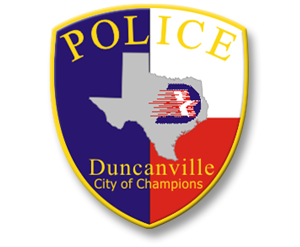 Police applicants with a minimum of one year full-time prior service as a police officer must possess a TCOLE license and/or have taken and passed the TCOLE state licensing exam to qualify for Credited Previous Experience and be placed in the current pay grade of the Duncanville Police Department compensation plan. Credited Previous Experience will not apply if more than three years have passed since the most recent qualifying employment. Population figures shall be based on current information from the UTSA Texas State Data Center or the latest United States census information if outside Texas. If you have any additional questions, please email Recruiter.